Yeah right. You can probably already guess where this is going. So what did we do along the way to the subantartic, desolated, windy, yet surprisingly warm island of Tierra del Fuego? And is it really the journey, or do we prefer the destination after all? 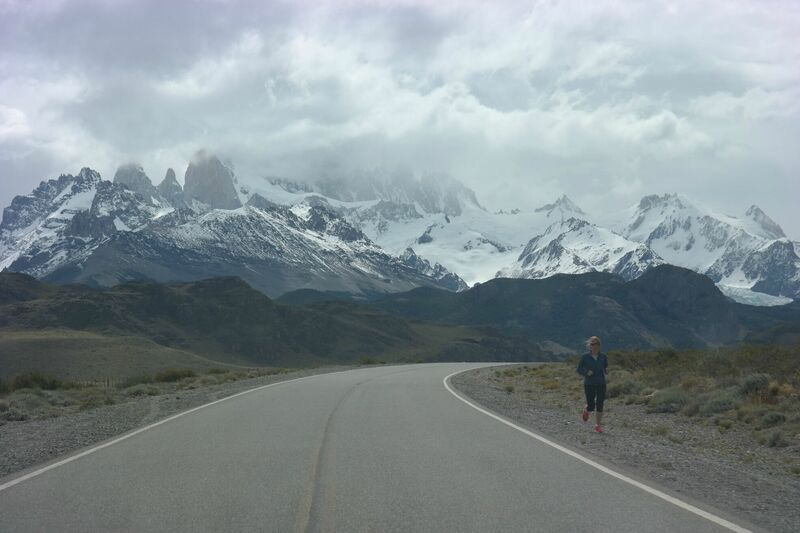 After driving through the stretching, curvy "roads" of the Carretera Austral and monotomous bits of the Ruta 40, we arrive in El Chaltén, Argentina. This little quiet mountain town is a welcoming place after the rather boring pampas (desert) of Argentina. The village is decked out with all kinds of restaurants, cervezerias, campings and luxurious hotels. Upon visiting the tourist information center, we're kindly invited to a informative talk by one of the rangers of the National Park. So there we are, along with 53 German retirees that just got off their tour bus. Armed to the teeth with a map, compass, binoculars and two backpacks full of camping gear and food, we begin our 3 day hike in El Parque Nacional Los Glaciares. 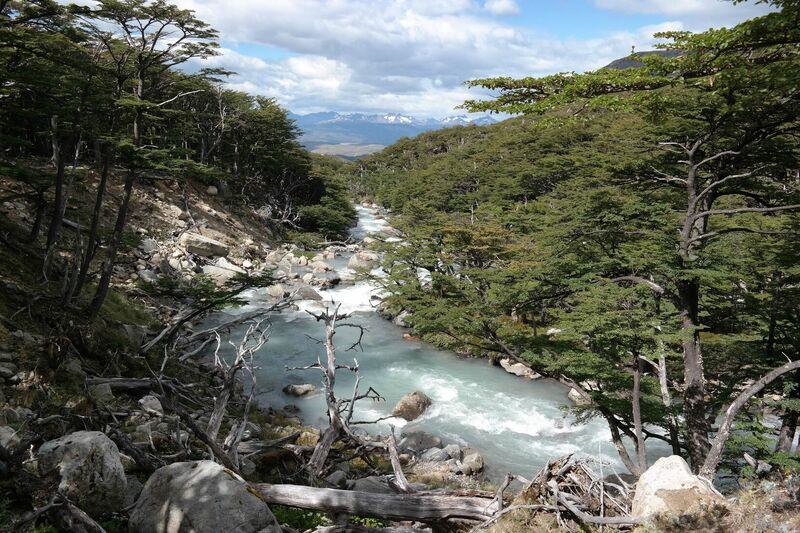 The hike starts at the northern exit of El Chaltén. After a few moments the first ascent leads to a mirador (lookout), from where a valley with a couple of winding rivers can be seen. This gives us a little time to relax and praise our backpacks, which don't really feel that heavy after all. Great! The sendero (trail) continues along a hill with lots of colorful flowers we haven't seen before. Hilltop after hilltop, there we go, until suddenly...BAM! There it is! Fitz Roy in all its might and beauty. The dazzling jagged lines of the mountain tops are really clear. 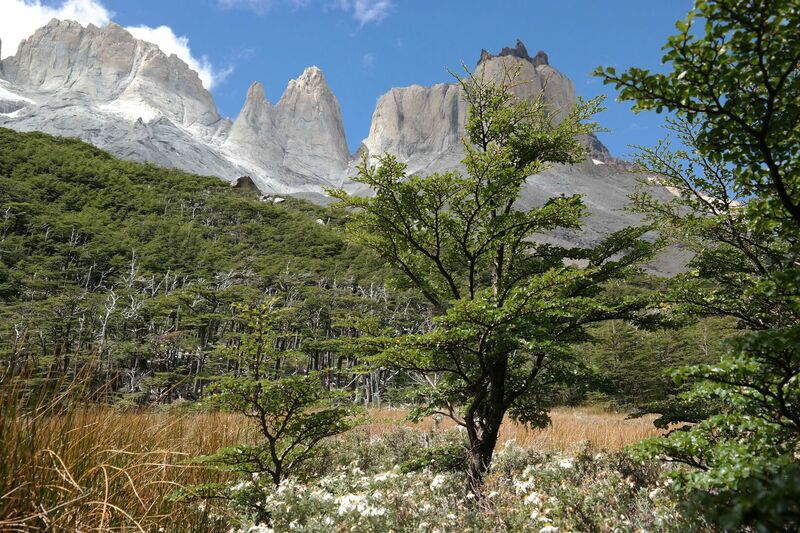 The word Chaltén translates to "Smoking Mountain" in Tehuelche, because it's usually covered in clouds. Today we thank all the Tehuelche gods for this exceptionally good weather. We stand there for a couple of minutes, awe struck, while killing the nearby pesky horseflies. There are lots of people around, often with just a small daypack. Our backpacks start to feel a little heavy the more we walk. 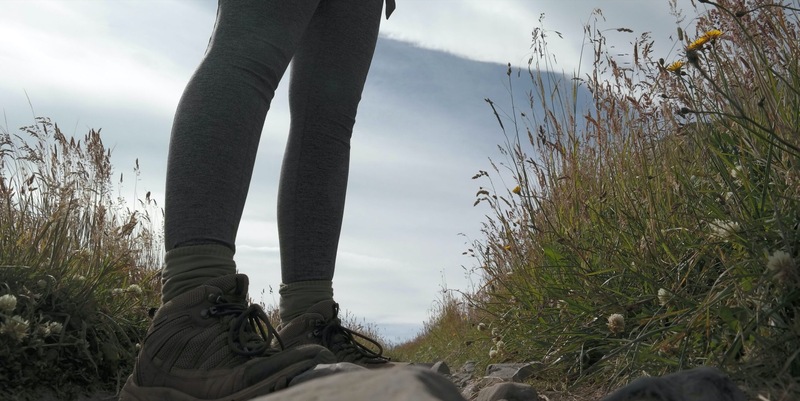 We look at the single day hikers with a little envy. A fresh sun glaring down on the ridge, instantly transforming them into almighty invincible super mountains. The only thing you can do at that moment is stand there, petrified, in total silence, like a little insignificant human, looking at the red crown that the sun has put on the world. These mountains are absolutely massive, you think. And then you think that again. And again. After two minutes the red color is gone, you feel normal again, and people around you start breathing again. Hiking away from Fitz Roy felt weird. There's a certain strong attractional force to it that makes you want to see it again. Perhaps even climb it, conquer it. Few people (2 or 3?) do so every year. This mountain is not easy to put a flag on. 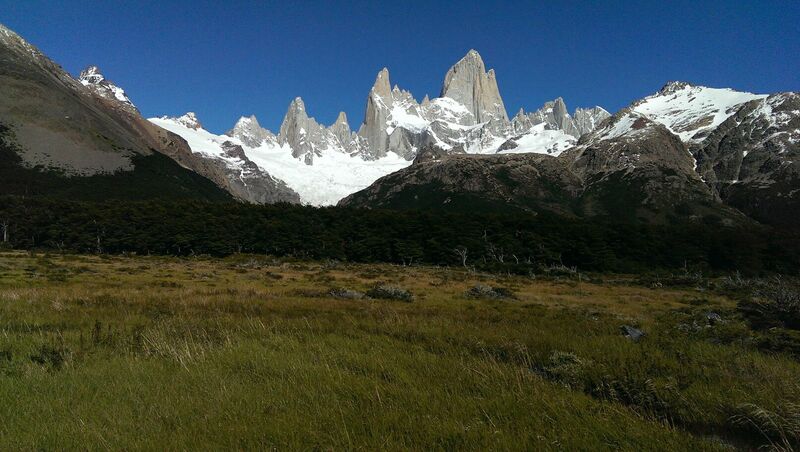 Dos Piratos: Hiking El Chaltén from Tim Blankers on Vimeo. 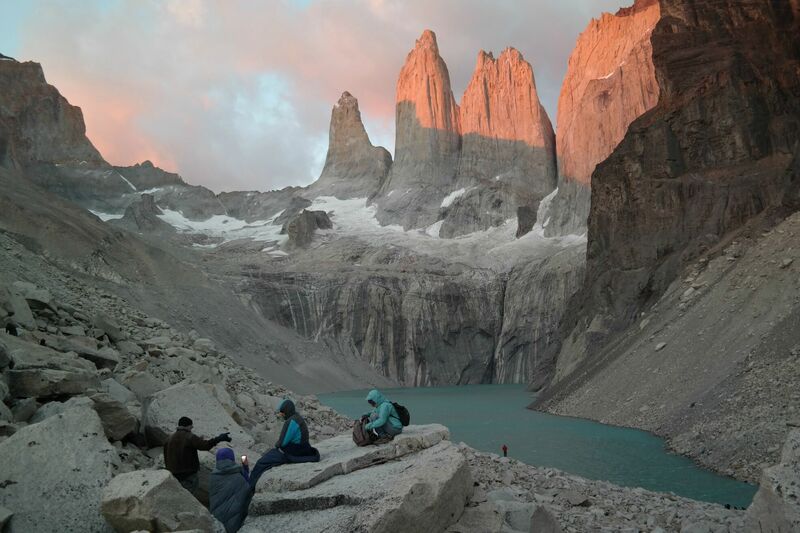 Next in line, the famous Torres del Paine. Visited by 150.000 visitors a year, this gigantic national park is known for its granite peaks, glaciers, lakes, and most of all: the 'W' hike, named after the shape of the letter. Not just your typical single day hike, this classic trek requires thorough preparations and planning. There are numerous ways to hike through the park. We opt for west to east, since that puts the best (although hardest) part in the end of this 5-day adventure. Again, there are only basic facilities along the way, so bringing your own camping gear and food is a must. I've been known to not have a very modest appetite, so carrying food for five days certainly is heavy. Lago Grey, the left leg of the W. And yes, the lake is indeed grey. 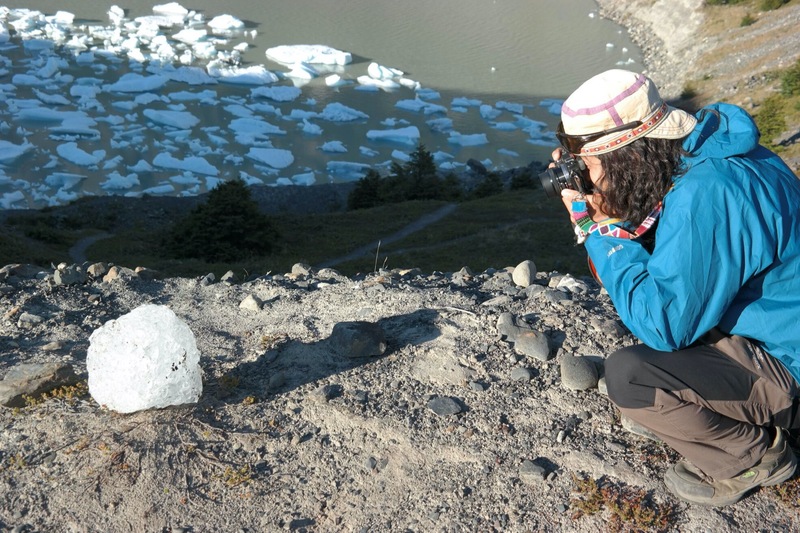 As the day of hiking passes, we encounter more and more floating icebergs. The ice itself originates from a vast glacier at the northern side. Over the years, the sheer size of the glacier compresses the ice so much, that most of the air bubbles are squeezed out. This gives the ice its distinct blue color. Suddenly I stumble upon this chunk of ice in the water, which I take out to analyze thorougly. At the same time this is laudly applauded by a (very funny) Japanese tourist, who joins me in the investigation. Valle Frances, the middle leg of the W. And yes, there are lots of hikers spreaking French here. The hike itself is a steep ascent to a great mirador in the center of the valley. We climb over rocks and streams, next to a granite ridge. While the view is obviously great, the sound was actually the most daunting. A few times a day, a deep thunder-like sound spread across the valley. Since we were told there is no natural thunder here, we are a bit surprised. As we turn around, we see this massive chunck of ice falling of a hanging glacier, causing a spectacular explosion of a mixture of snow, rock, water and ice. Awesome! Las Torres, the right leg of the W. Some say the Torres are the most beautiful things they have ever seen. Some say the Torres don't actually exist, there are only clouds up there. We did see them, and again at sunrise. 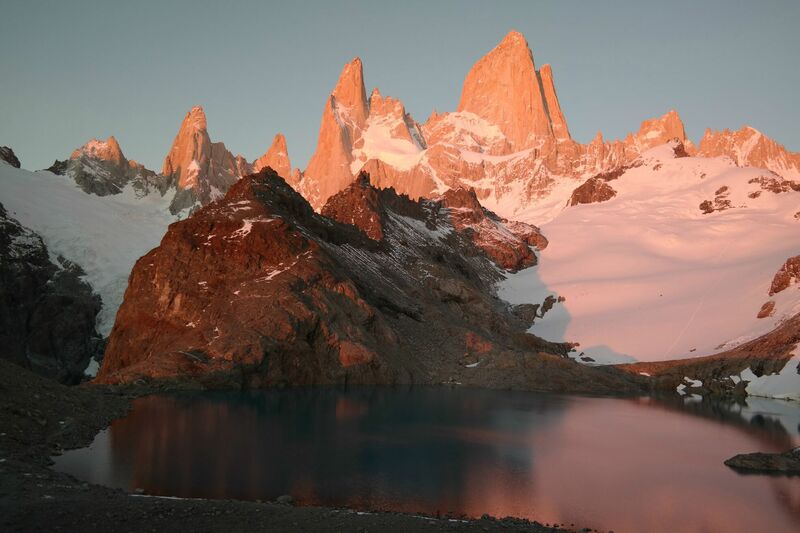 Read the part about Fitz Roy again to get a feeling about this sunrise. 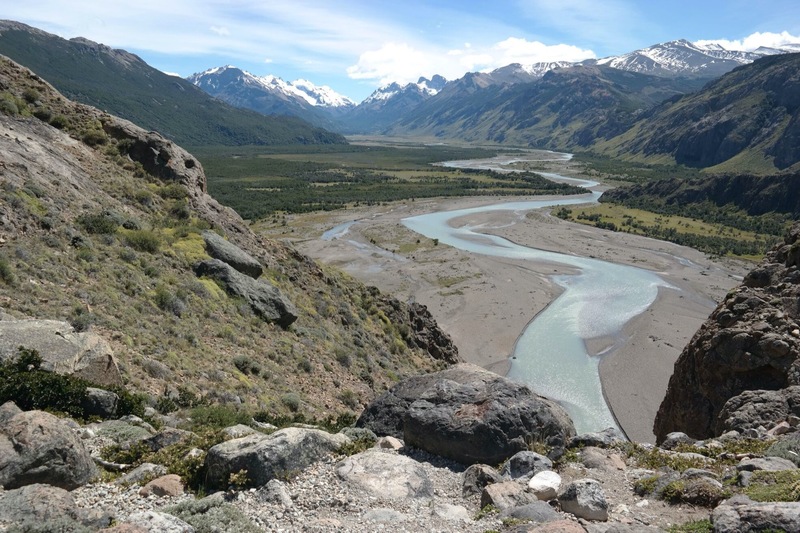 These two hikes left a wonderful impression on our trip in Patagonia. The long days of hiking were absolutely worth it. There are different ways of doing it. We've seen people running the entire 'W', or carrying a baby, while wearing anything from the most fancy North Face Goretex waterproof super shoes to tiger print tight fit T-shirts. Some Aussies supposedly did the 'W' on flipflops. Whatever you do, remember that you spend the greatest amount of time doing the journey itself, while looking around you at a summit usually doesn't last longer than one hour. Yes, the summit is totally awesome. You feel like you've made it. You get the best views. This is why you've put in all the hard work of hiking up that mountain. But that's only partly right. If you take things slowly, look around you and absorb the tremendous experience the journey gives you, the summit automatically becomes more valuable as well. So take things slowly, there's no hurry. Enjoy the moment.